It’s a strange and wonderful sampling instrument and live rig, capable of mangling and remixing live, synced to tempo. It’s proof that live computer performance doesn’t have to be in only one tool, or use one technique. It’s a ready-to-play, affordable instrument you can pick up and use. It’s a Reaktor patch gurus can pick apart and learn from, along with other resources from one of Reaktor’s masters. It’s a new blog and an opportunity to talk about live performance. It’s an EP release. It’s actually all of these things – a tool, but more than a tool. The Finger, a US$79 / EUR 69 instrument, is a product, first and foremost, created by master live electronic performer and hacker Tim Exile. Tim is such a dedicated Reaktor user that he once managed to give himself a repetitive stress injury from connecting patch cords. (Not recommended.) You can run this thing out of the box using the free Kore Player, or get in deeper with a full version of Kore, or get into the patch itself with a copy of Reaktor 5 (also included in Komplete 5 and 6). It’s quite a product, too. I could try to explain it, but I couldn’t possibly do as good a job as Tim does in the video. I’m not sure I agree with the marketing material’s claim that this is “a new type of live performance and remix effect.” In fact, Reaktor, Max/MSP, and other tools have led to all sorts of similar, original performance tools. Unlike going into a gig with just an Ableton Live set (something I’m doing in, literally, fifteen minutes), having a custom tool means focusing on performance techniques. And “new” hardly matters – Tim is a ninja at working with Reaktor’s deep sound DSP layer, Core (not to be confused with Kore). Whether it’s new or not, this is the ultimate patch from one of Reaktor’s masters. Along with Reaktor creator Stephan Schmitt’s Spark, it’s proof that sound packs from NI – or anyone else for that matter – don’t have to be limited to stock presets. Other folks I know have picked up The Finger and started to play with it, including the underlying Reaktor patch. Most notably, see Richard Devine transform The Finger from a Sound-Like-Tim-Exile machine into a Richard-Devine-Sonic-Insanity-Generator. (See, just because you use someone else’s tool doesn’t have to mean you need to sound like them.) With Max for Live coming, hackers getting smarter and slicker with open source tools like Processing, ChucK, SoundCollider, and Pd, and techno-literacy again on the rise – more connected than ever by these Interwebs – I think we could be in store for a really wonderful age of creativity, in which people make part of the craft of music making the craft of tool making, as well. Designing a tool, after all, is designing a system, in the same way that composition (in any medium) is about designing a system. Finally, instead of keeping that to ourselves, we can actually share the whole process. In the meantime, let’s watch those videos, on Reaktor, The Finger, and more. Native Instruments The Finger vs Richard Devine from Richard Devine on Vimeo. Sugar Bytes Artillery2, which focuses more on effects – and offers a whopping amount of effects variety, from step-sequenced buffer scratchers to vocoding. As with The Finger, the idea is to map effects to keys. Rekkerd notes that Sugar Bytes has just discounted Artillery2 to 50% through October. Devoted loop manglers will buy both. I’m going to wait for a Richard Devine video in which he routes Artillery2, Lucifer, and The Finger together in one chain, then randomizes all the settings – your move, Richard. 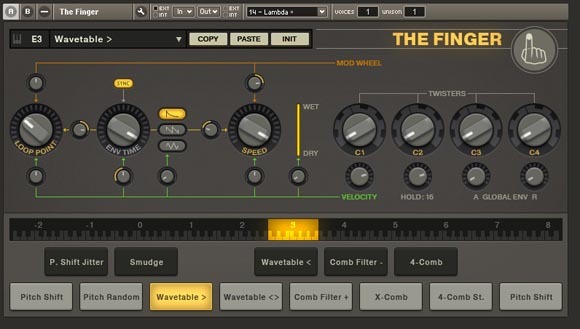 The Lucifer plug-in is now discontinued, but Devine Machine offer a range of related looper/performance tools – from the practical tools to the manglers. The basic ideas here I think are worth copying: making use of the keyboard to control things live rather than having modulation all running automatically, routing different effects together for mangled results, and loop recording and effects that are synced it time are all useful concepts to combine. I’d love to see people push those concepts in various directions, and the exact combination of ingredients you want is likely to be personal, so it’s well-suited to DIY concoctions, too.